Imagine taking in the sights and scenes of the landscape beyond your home—all from the soaring heights of your own rooftop deck. A deck installed on your roof adds a luxury feel to your home. It improves the architectural aesthetics of your property and provides a place to practice yoga at sunrise, have an outdoor get-together, or just a spot to sip a few cocktails while you survey the world around you. 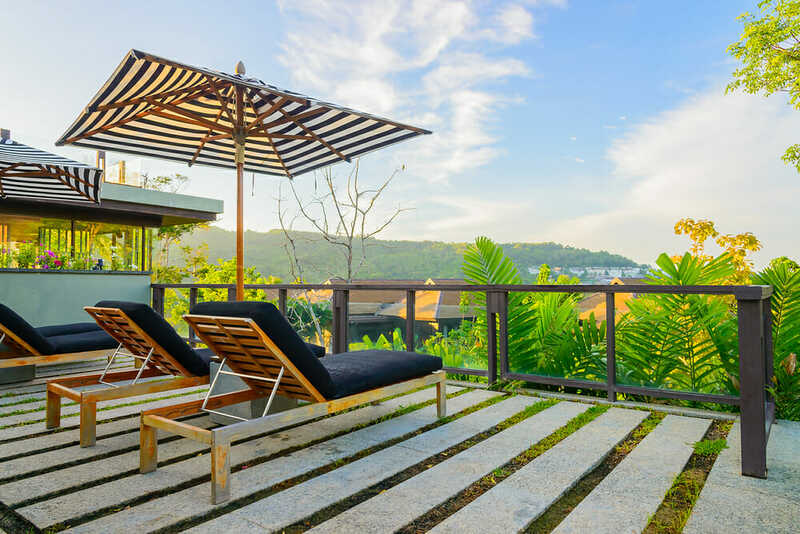 As if that didn’t sound appealing enough already, a rooftop patio is a hot commodity among homebuyers, meaning this is one amenity that may be well worth the money you spend. In urban markets, a rooftop deck may return almost 150% of the project costs in resale value, especially in warmer climates, where homeowners can enjoy their deck year round. Still, installing a rooftop patio is a major investment. Homeowners should budget at least $25,000 for a basic deck. In fact, you might spend up to $50,000 or more if you’d like more luxury features, like a bar or outdoor kitchen. Factors like the size, the materials you choose, the framing, and the finishes, can affect the overall price as well. Curious about the specifics? Here’s how much you should save for your rooftop remodel. It makes sense that the larger you go with your patio, the more you’ll have to pay to have it constructed. After all, your builder will need to purchase more materials to increase the square footage. 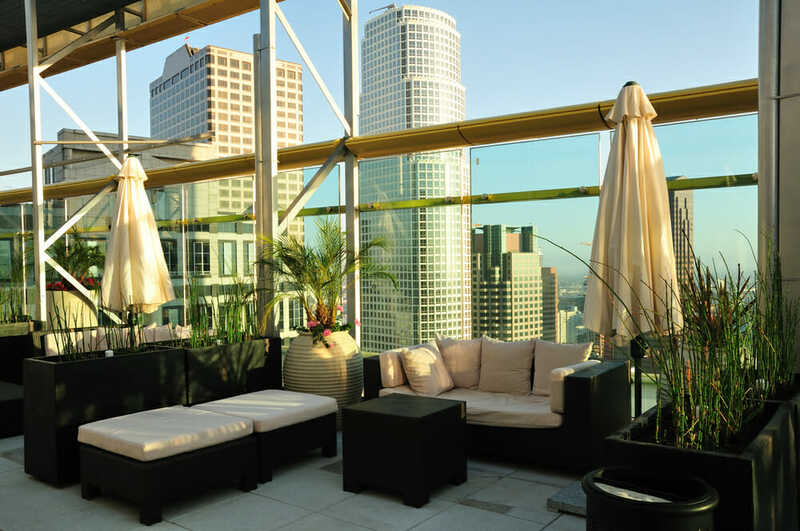 The average size for a rooftop patio ranges between 150 to 300 square feet. However, you can go even larger than that, depending upon your needs and the size of your home. Keep in mind that your local building department may provide size restrictions or guidelines for your deck as well. Probably the number one factor affecting your deck’s final cost is the flooring material you choose. Lumber offers the cheapest option—expect to pay no more than $20 per board for redwood, cedar, and yellow pine. Using composite or vinyl decking will increase the durability of your patio, so you’ll get more longevity out of your space, but it also raises the price up to $10 per board. A contractor may bill around $1,000 in labor fees for your new deck. But if your patio has a number of site conditions that add complexity to the project, such as a very elevated floor or a complicated design, they may charge a higher price for their work. Additionally, you may need to hire an architect to consult with your contractor as well. And that means another several thousand dollars tacked onto your total—around $5,000, on average. You’ll probably want to spend as much time as possible on your deck once it’s finally constructed. After all, you want to make sure you get a chance to enjoy your new space! And to really get the full experience, you may find you need to invest in certain additional features, like seating, awnings, barbecues, outdoor kitchens, or built-in bars—all of which will make your patio more convenient and comfortable. For seating, plan on spending between $500 to $1,500. For an outdoor kitchen? Budget around $3,000 for a more basic countertop, or up to $15,000 for a more complicated design, especially if you’re planning on running electric and plumbing lines up to your deck. If you’d like to use your rooftop deck all year long, some shelter from the elements may be called for. You have a few options here: you can go with an attachable awning purchased from an outdoor supply store, or build one for yourself as a DIY project. Or you can opt for a screened-in or open roof. Expect to spend somewhere between $900 to $2,000 to construct a shelter for your deck. Before you start calling around to get your project started, you’ll want to consider the age of your existing roof. It doesn’t exactly make sense to install a rooftop deck over your shingles if they’re coming up on the end of their lifespan. Depending upon the conditions in your area and your roofing material, your roof needs to be replaced every 15 to 20 years. However, even if your roof is relatively young, you should have an inspector take a look at it before starting on your deck. They can make sure that there’s no rot, mold, or other damage that could interfere with your deck construction. If you do need to replace your roof first, factor in $3,000 to $10,000 to your project’s expenses. Don’t let your insurance catch you off guard! A new deck may count as a structural addition to your home, and that can raise your insurance premiums significantly. And it could even cause your property rates to go up as well. Be sure to budget for an increase in these fees, too. There’s definitely a lot to consider with a new rooftop deck or patio. But it will all seem well worth it when it’s finally built, and you can gaze into the horizon beyond, toasting to the sunset.